Nanoscale pattern transfer technology using molds is a rapidly advancing area and one that has seen much recent attention due to its potential for use in nanotechnology industries and applications. However, because of these rapid advances, it can be difficult to keep up with the technological trends and the latest cutting-edge methods. In order to fully understand these pioneering technologies, a comprehensive understanding of the basic science and an overview of the techniques are required. Nanoimprint Technology: Nanotransfer for Thermoplastic and Photocurable Polymers covers the latest nanotransfer science based on polymer behaviour. Polymer fluid dynamics are described in detail, and injection moulding, nanoimprint lithography and micro contact printing are also discussed. Cutting-edge nanotransfer technologies and applications are also considered and future trends in industry are examined. 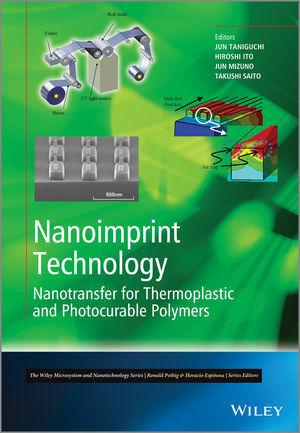 Nanoimprint Technology: Nanotransfer for Thermoplastic and Photocurable Polymers is a comprehensive reference for industry engineers as well as graduate and undergraduate students, and is a useful source of information for anyone looking to improve their understanding of nanotransfer mechanisms and methods. Jun Taniguchi is an Associate Professor in the Faculty of Industrial Science and Technology, at Tokyo University of Science in Japan. His research interests include electron beam lithography, nanoimprint lithography and nanotechnology. Jun Mizuno is an Associate Professor in the Nanotechnology Research Laboratory at Waseda University in Japan. His research interests include nanomaterials and intelligent mechanics.